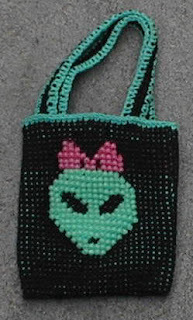 I was going through a lot of old files today looking for the graph for a purse I made a few years back. Still haven't found that, but did find these old graphs, done to compare graph types. Beads- the most popular stitches are brick and peyote. The most popular beads are Delica size 11 cylinder beads. So that's how I planned these graphs. Delicas are slightly smaller from hole to hole then from outside edge to outside edge. When you're working in peyote stitch, generally the holes will line up vertically. Peyote is also offset by half. These graphs are original size, so they don't need to be clicked. Shown shaded and I have no idea now what my reasoning behind that was. Because of the aspect ratio, these are 39 beads wide and 36 beads tall. Knit stitches, working up from a cast on edge instead side to side, are shorter than they are wide. So if you graph something on a square graph, it might work. But more likely it's going to come out squashed. It varies some, but generally, the ratio is close enough to Delica type beads that a knitting graph will work on loom or square stitch for beads. Click on the images for larger versions. These are meant to be used for smaller washcloths. (but would also look awesome at the bottom of a scarf!) 40 stitches across and 57 rows tall. I have no idea if that's helpful to anyone, but it was fun finding them! There are tons of different kinds of graph paper available for free on my old classic webpage here. Oh, this is the purse that got me searching. As soon as I find the graphs, I'll post them!